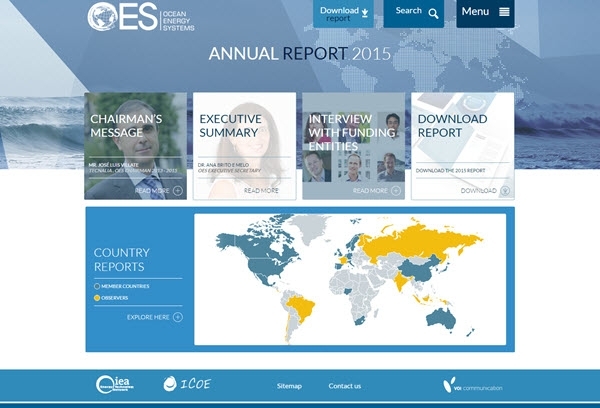 The OES Annual Report 2015 is now online! Published on April 22th 2016 the latest year-end report from Ocean Energy Systems (OES) not only covers analyses of current member countries but this year invites key players in international funding to discuss all aspects of the finance and funding initiatives required to drive the industry forward. Interviewees include representatives from the US Department of Energy, Wave Energy Scotland, Nagasaki Marine Industry Cluster Promotion Association, Inter-American Development Bank and the European Commission. In particular, questions were designed to highlight the true situation regarding funding for ocean energy projects. Contributors did not hold back when describing the reality. Both Takaaki Morita and Simon Robertson of Japan’s Marine Industry Development Office agree that “in order to help trigger a long term commitment from the industry, it is necessary for the centre to successfully demonstrate renewable energy turbines, even at a modest level. In addition to proving the technology, a positive regulatory environment including public funding support is required to commercialise the sector”. Tim Hurst of Wave Energy Scotland points out that “a shift away from marine renewables by the UK government has caused potential investors to step back from the industry. Before, these investors and OEMs will return there needs to sufficient technical success demonstrated to show beyond doubt that the large investment required to commercialise the technology can be justified”. One of the issues which came to light during the interview sessions was that of data sharing and transparency. Alison La Bonte of the US Department of Energy described the establishment of a ‘data repository’ which insists that all US government funded projects make their data publically available after a certain time and that ‘willingness to share data’ was an evaluation criterion in awarding grants and other funding to viable projects. Christoph Tagwerker of the Inter-American Development Bank accepted that “more public information is needed and non-disclosure of information in the industry is a barrier for further development”. He suggested that incentives for collaboration between developers of similar technologies might help reduce the amount of support needed. Matthijs Soede of the European Commission pointed to the support for ‘Ocean Energy Forum’ as an example of the level of commitment to Ocean Energy saying “it is clear that manufacturers and utilities are interested in technological development”. He also cites the widespread participation in projects like ‘Horizon 2020’ as an example of commitment, going on to say “we have never financed so many ocean energy projects on a European level like now. I hope we will have great results in the coming year helping the whole sector to develop”. This particular interview style has proved to be an excellent way to elicit concise and meaningful comments from key players in the ocean energy sphere. Commenting on the format José Luis Villate, Chairman of OES said “We are delighted with the participation of such key opinion formers and especially in their frank and candid answers to questions on topics which are at the heart of our vision for the industry’s growth”. Click here to explore the 2015 anual report online or download a copy!